If you are ready to get in the water, we are ready to get you in some gear! 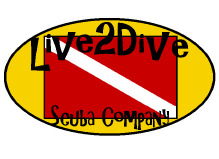 Live2Dive Scuba has complete sets of dive gear available and you can rent individual components or a whole set! A minimum Open Water Scuba Certification from an internationally recognized certification agency is required before we will rent you tanks or regulator.